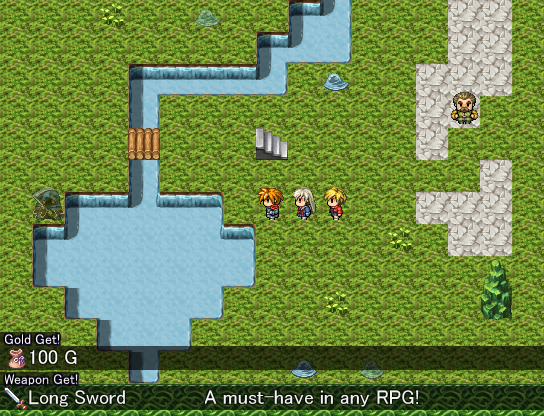 Hero & Daughter is a dungeon-crawling hack-and-slash RPG by tachi made in RPG Maker VX Ace. The game is primarily about running dungeons for loot and levels until you grow powerful enough to clear them. 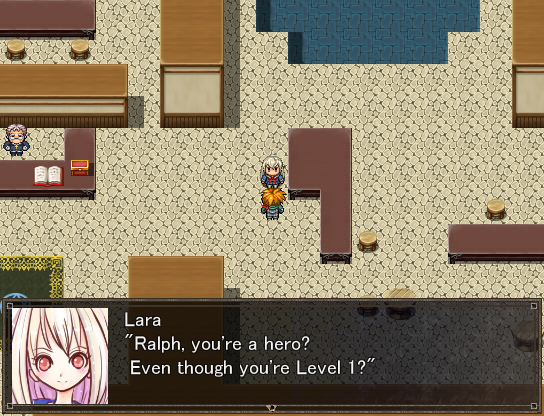 The veteran hero Ralph has been punished for his hubris by being dropped down to Level 1. Unable to level up whatsoever, all seems hopeless until he finds a helpful summoner. Note that the girls in the game are not "the hero's daughters" or anything. Basically, it's just an oddly literal translation of the word "musume" (girl) that would have been more odd to change. Risque art for many of the girls. The worst offenders are the hot springs images, which only somewhat cover things with towels or fog. Hero & Daughter is now available on Steam. Version 2.8.2 will remain free here, but the Steam version has additional updates. To avoid memory overuse, the game clears its cache of loaded resources every time you return from a dungeon. This can add a bit of lag, particularly in battles where many new attack effects and sounds are being loaded in a row. To make resources only load once and never unload, open Game.ini and change "NeverClear=0" from 0 to 1. Be warned that this could increase the odds of crashing after playing for a while. Full set of affection conversations for all girls! Win coins to spend on all kinds of prizes! Will stay in sync from now on! Home Sweet Home system: collect furniture, wallpaper, and flooring to decorate rooms! Made damage display for drain/etc. Adjusted price and effect of veggies/etc. A difficult dungeon with 100 floors! You can beat up a defenseless slime! New character: the Red Witch! If you already have the EXP, anything that adds EXP will level you up to the correct level. The item and accessory shops fill out at level 18. Tracked in a book in the bar. Purely a bonus. The book will be blue if you start a new game now, and yellow if you transferred from earlier versions. Strong foes less suspectible to instadeath, etc. The village's level goes up to 100, with experience requirements following the pattern 300 * PreviousLevel2. Girls who stay behind at the village provide EXP each expedition, which goes as high as their LUK and as low as... slightly less than that. Shopping at the Item, Spell, and Accessory Shops adds GoldSpent/10 EXP. Selling items at the Guild adds GoldEarned/10 EXP. When you defend the village, you earn EnemyTier * 100 EXP. When you fail to defend it, you lose VillageLevel * 200 EXP. The Item and Spell Shops get one more item/low-level spell in stock each level up to 18. At level 20, the Spell Shop starts getting a new high-level spell every 5 levels up to 80. The Accessory Shop gets new, more affectionate gifts at level 4, 7, 10, and 13. Defense encounters are unrelated to village level; you advance to a harder tier every time you win, and go back to 1 when you lose. Restaurant meals add more stat points at higher village levels, and are also twice as effective if the stats in question are low. The HP/MP meals add 5 * Level, but it's 10 * Level if you have less than 1000 in the stat. ATK/DEF/MAT/MDF/AGI/LUK are all 1 * Level, but 2 * Level if you have less than 150 in the stat. Ralph can gain stats through various means: the restaurant, stat-up items, and training while doing Challenge Tower. These stat boosts have no real limit and can take him up to flat-out maximum stats: 999,999 HP, and 99,999 everything else. Since the girls get stats from leveling, they are limited in how many stat gains they can get. Every point they gain is tracked, and they can't gain any more than 1,000 extra points in a stat (for HP, it's 10,000). Extra points can be checked (and adjusted) from the fireplace after beating the first Dark Lord. Thus, the max stats for girls are what her Level 999 base stats are, plus 1,000/10,000. You can use Goral to guarantee encountering a certain Map ID to ensure you find a wanted monster. After beating Part 3, The Dark Lord appears as a secret bounty on map 9 of the first Dark Lord's Castle, with a reward of 1,000,000 G.
Lara is always summoned automatically in the intro. All the other girls are picked completely at random when you use a Summon Stone. If it picks a girl you already summoned, it rolls the dice again in an attempt to get one you haven't. After enough rerolls without a new girl, it will eventually settle for the Memories item of a girl you already have. Candy Lix can only be summoned after you defeat her; she appears on the stairs of Forest Dungeon Floor ID #1. Dark Lord Arue can only be summoned after you defeat her in Part 2. Spirit Queen can only be summoned after beating Part 2. Carrot can only be summoned after beating Part 4. Leffy comes to the village after three losses in battle. Challenge and beat her to have her join. Haeti joins at the end of Part 4. Anth joins at the end of Part 6. There's an Extra Room in the pub where you can summon bonus characters with codes. Bonus characters are basically battle members only - they have no affection convos or other scenes. Currently, there are two bonus characters: I'm A Dark Lord and Deste. You gain 1 affection with a girl every "weak enemy" you battle with her in the party, and can give accessories as gifts to add more. Every time you have a new conversation with a girl in the pub, even the first 0-affection one, you get 5 bonus affection points. Also, of course, you can buy accessories to give her and raise it by a certain amount. Every 100 affection you get with a girl up to 1500, you have a conversation the next time you talk to her in the pub. Special conversations with an illustration occur at 800. 2000 is the requirement to enter the hot springs. However, affection will continue to go up far past this without any sort of limit. 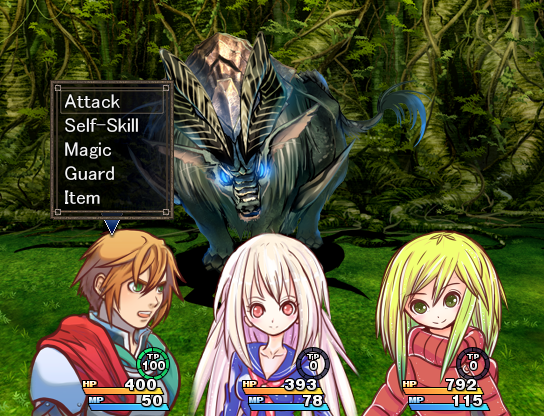 Affection's only gameplay effect is on the (Name) Heart skills from the hot springs, which do "Affection - Enemy Defense" damage. After beating Part 1, a clown will appear in the top-left of the village who resets the conversation flags, allowing you to rewatch them. There are "plot" scenes that play after your first expedition and after first beating each dungeon. Plot scenes take precedent over everything else. If there are none to play, there's a 30% chance it'll pick a random return scene. If you have the girl(s) for the random scene and have not seen it, it will play; otherwise, it will reroll up to 90 times. If no scene is chosen, it checks if the village should be attacked. The village cannot be attacked if there are less than two girls working in the village. If there are enough girls, and you've gone at least one trip without an attack, then it's possible there will be an attack. The odds increase the longer you go without one, becoming a certainty after eight times. After beating the first Dark Lord, you unlock Challenge Tower left from the village. There's a boss every 10 floors, and beating it will give you a checkpoint you can return to from the base. Beating the 100F boss will get you the C-Charger when you return to the Challenge Tower area. This is a one-of-a-kind accessory that gives the holder 5x EXP gain. In addition to CP gained in battles and from Tower chests, there are three CP bonuses. The C-Floor bonus simply gives FloorNum CP when you reach a new floor, maxing out at 1000. The C-Win bonus gives you FloorNum * 5 CP for beating normal enemies on a floor. The C-Wipe bonus gives you FloorNum * 10 CP for losing to normal enemies, but maxes at 1000. Switches cost FloorNum * 5 CP (up to 5000) per use. They cause random effects, all beneficial. Either the party gets recovered for HP/MP/TP/all three, or you get an advantage in the next Challenger battle. After beating 100F, if you've done 30 dungeon dives, floors 101 to 1000 will unlock when you enter the lobby. Here, there's a boss and checkpoint every 100 floors. But don't worry - warp circles start to appear after 100F. Warp circles will take you up a random amount of floors, as many as 30 (there's about a 21% chance of going up 30). Obviously, warp circles will stop at boss floors. No skipping past those, unfortunately. Beating the 1000F boss will get you the C-Magic Herb, which halves magic cost. After beating 1000F, if you've used enough stat-ups to add a total of 1,000 stat points, you unlock up to 9999F. You guessed it - a boss every 1000 floors. But the warp circles change to accomodate. Warp circles on 1001F and up will take you up as many as 200 floors, with about a 13% chance of reaching that limit. Beating the 9999F boss (good luck) will get you the C-Magic Avoid, which adds 50% magic evasion. The Monster House opens up in the top-right of the village after beating the first Dark Lord. After first visiting the Monster House, recruitable monsters will appear in dungeons. There are nine monsters in total: you start with the Dragon, and there's one to recruit on "Floor ID #1" of the first 8 dungeons. Monsters level up from EXP and get stat increases on curves like any party member, even using new skills in battle at higher levels. When Ralph gives monsters stats directly, these are simply added directly onto their base stats. If you raise a monster to Level 100+ and then beat it, you get the Monster Heart. When equipped on Ralph, enemy remarks and thoughts will appear at the start of battle. When monsters are set to defend the village, the matchup is based on the total levels of all monsters. Specifically, this total level is compared against the enemy tier multiplied by a random value from 5 to 200 (y-yeah). Consequences are the same as winning or losing with the girls, except you don't lose village EXP if your monsters lose. So activating monster defenses lets you ignore attacks, basically. The main disadvantage is girls in reserve don't get to level up from it. By default, about 85% of all possible enemies will spawn in. When Goral is told to reduce enemies, about 25% spawn. When told to increase them, 100% of them spawn. About 68% of enemy spawns are "weak" (slimes), 16% are "strong" (reapers), and 16% are "rare" (yellow ghosts). However, there can only be as many as two "special" (strong or rare) spawns per floor. There is a 90% chance for a chest to be red, 8% for it to be blue, and 2% for it to be silver. Loot has five types: item, weapon, armor, gold, or furniture. The type is picked randomly with even distribution. However, blue/silver chests will never contain gold, and there's a 50% chance red ones will reroll in an attempt to "avoid" gold. If "item" is picked, the item is picked at random from a pool of 29. "Gold" is just a random number from 1 to 4 times 100. Each dungeon has an upper limit on the quality of weapons/armor from their chests, which is higher in the more difficult dungeons. Blue chests have better odds of approaching "max quality," and silver chests have the best odds. Some dungeons have a few special grayish-brown chests in fixed positions. These chests always contain a Summon Stone, but disappear for good once they've been collected. Regular chests also have a 1/29 chance of containing Summon Stones... if the chest contains an item. So if you want to farm them, have Goral set chests to items only. Fight him and win for Dungeon Pillar type furniture (8 total). Keep donating to get Statue furniture at total milestones. Milestones: 1, 1,500, 5,000, 15,000, 38,000, 70,000, 120,000. 200,000 gives you the Legendary Cross furniture. After this is 210,000, then it increases by 50,000 each time, but it only gives a random Statue repeat. The number of times he jumps shows his hand: 1 for Rock, 2 for Paper, 3 for Scissors. You get random furniture (13 total) for winning; pots, barrels, boxes, etc. Always sells two random standard chest items. Then he adds furniture items with continually-halving odds: having 1 furniture item is guaranteed, 2 is 50%, 3 is 25%, etc. Each time this "succeeds," an item from the general furniture selection is added (20 types total, cost 20,000 G). For each "success," there's then a 50-50 that a run-down bed will be sold as well (4 types total, cost 30,000 G). When you first meet him, you give him an investment for his next adventure. Next time you meet, he'll repay you based on your last investment. Your total accumulated investment also helps - the true value used for calculations is LastInvestment + Total/50. Repayment can be as many as 10 items, selected at random from three choices. When an item is picked, it "uses up" some investment, and it stops when it gets too low or hits 10 items. a) Random Model furniture (47 total), using 30,000 of your investment. b) A random Veggies stat-up item, using 9,000 of your investment. c) A standard chest item, using 1,000 of your investment. If you don't end up with any items, you get a consolation potion. Give her 10,000 of Ralph's EXP for a random selection of furniture (23 total). Either gives Ralph 150 max HP and heals him, or takes 100 max HP nad puts him near death. It's a straight 50-50 chance. If the latter happens, she also gives you an item from a small selection of random furniture (6 total). Mash the button. If you get over 20, you get random furniture (9 total). You get 100 village EXP for each hit. 2. Really good. Random furniture (7 total): a teddy bear, rabbit, or presents. 3. Foul mood. Ralph takes 10,000 damage. 4. Gloomy. Mugged for 5,000 G.
Holding Down after choosing New Game will skip the intro. Holding Shift when leaving the bar will warp you to House Park, and vice versa. Holding Shift when using a capsule machine will let you get three capsules at once. Holding Shift after the "girl contributions" part of returning to the village will improve the odds of a return event appearing. An endless supply of EXPointless accessories, which make people get 0 EXP, are hidden in the bookcase in the pub. After beating Part 1, the fireplace in the pub will let you reduce stats and village EXP. The Otherworld, Monster House, Challenge Tower, and Extra Room can be entered early by checking the sign/rocks/barrel 10 times. An old lady who randomly appears as a village NPC gives out Healer Tomes; Healer is a full-party healing spell. Walkmaster, who randomly appears as a village NPC, pays 1 G for every step you've taken. After beating Part 4, dungeon bosses on the first continent have a 50-50 chance of transforming into secret bosses.